Stageworks products have been born out of a simple premise; to provide top quality, easy to use music products and accessories that alleviate some of the common problems faced by today’s working musicians. After extensive road testing (& some squabbling between band members) we realised that our Stageworks ® Mat not only helped with keyboard pedals but was perfect for guitar effects as well as drum and hihat pedals. It is even used to keep lap steel guitars from slipping and is great with floor percussion too! The Rimma® was designed to make it easier for drummers to store their sticks on a drum kit in a way that they can be accessed quickly without interrupting the performance. Most conventional stick holders are positioned to the side of the drummer. This can cause a loss of balance when reaching for the sticks. The Rimma® allows the sticks to rest directly in front of the drummer on the rim of the bass drum. By positioning the sticks in direct line of sight, and within easy reach you can eliminate the loss of balance. The quick release mechanism ensures that whilst reaching for your sticks you’ll ‘never miss a beat! The Rimma sits on top of the bass drum hoop in front of the drummer providing easy access and quick release of sticks while playing. The grip plates hold two sticks securely in place. 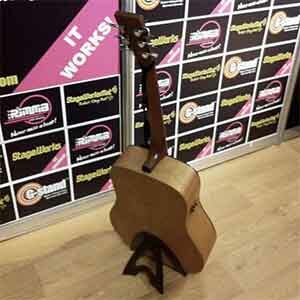 The G-Stand® is a revolutionary guitar stand that attaches directly onto your acoustic / electro-acoustic guitar. Unlike conventional guitar stands The G-stand® is fixed onto your guitar and remains attached to your guitar even while you play it! Simply pull open the back the leg of the stand and your guitar is ready for you to put it down exactly where you want it! The Stageworks non-slip pedal mats are made of a durable 3 piece material. They have been tested to work on the most challenging surfaces providing firm hold for the pedal and no slippage across the floor. Easily portable the slip mats can be packed away in your case for ease of travel. Ideal for keyboard pedals as you can place both your foot and the pedal onto the mat thus avoiding the forces that would move your pedal across the floor. Why not try it with your guitar or bass effects pedals! Also extremely useful for electronic drum kits and for high hat and bass drum pedals where spikes need to be retracted. You can use the mat to stop lap steel guitars slipping too!